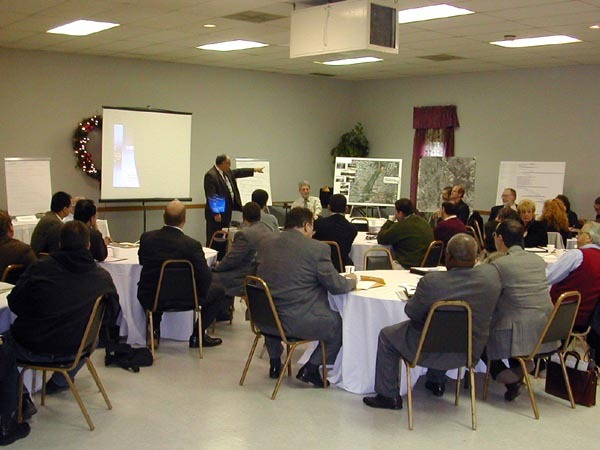 A two-day partnering meeting was held on December 11 & 12, 2001 at the PBA Hall in Barrington, NJ. Participants included local elected officials, representatives from federal, state and county government, as well as members of the New Jersey Department of Transportation (NJDOT) Project Team. The purpose of the partnering session was to promote agency coordination over the life of the project, receive input regarding the purpose and need of the project, and identify important issues among all participants. During the two-day process, participants toured the project area and exchanged ideas about project issues through in-depth group discussions and break-out groups. Below are pictures from the partnering sessions, which include the bus tour of the project area and discussion groups.